Ascend to the amazing ‘At the Top’ 124th floor Observation Deck by high-speed elevator, travelling at 10 metres per second. The doors open to reveal floor-to-ceiling glass walls and spectacular unobstructed 360-degree views of Dubai and beyond. From your lofty position you will be able to really appreciate Dubai’s 21st century skyline, the desert and the sparkling waters of the Arabian Gulf. If you wish, adventure outside onto the open-air terrace to enjoy another perspective of the sweeping views below. The Burj Khalifa At the Top 124th Floor Observation Deck is an extremely popular attraction and often sells out (especially druing November to January), so it is strongly recommended to book your tickets in advance. Advance purchase tickets offer a considerable saving on walk-up prices and you can simply collect the tickets on arrival at the Burj Khalifa. The Burj Khalifa Observation Deck is open from 8.30am to 12.00am (last entry at 11.00pm) and you must select the date and time you wish to visit the Burj Khalifa at the time of booking - Tickets cannot be used at a different time. Important: Due to the huge levels of demand, Burj Khalifa Observation Deck tickets are on a request basis and the exact time of your ticket is not guaranteed until we confirm your booking and send your attraction documentation. If your chosen time is not available, we will advise the closest time available to your original choice. Please note, the most popular time to visit the Burj Khalifa Observation Deck is between 3.00pm to 8.00pm and these times sell out quickly. A typical visit to the Burj Khalifa lasts around 90 minutes. The Burj Khalifa At the Top 124th Floor Observation Deck is open from 8.30am to 12.00am (last entry at 11.00pm). You must select the date and time you wish to visit the Burj Khalifa. Tickets cannot be used at a different time. 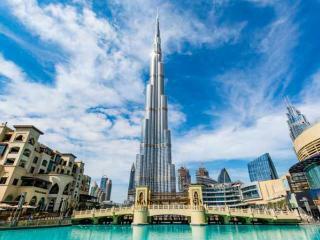 Burj Khalifa is an extremely popular attraction and often sells out. The exact time of visit is not guaranteed until we send out your attraction documentation. If your requested time is not available we will advise the closest time available to your original choice. If you are travelling outside of 30 days of your Burj Khalifa visit, although your booking will be confirmed, tickets will not be available to download until 30 days before your visit date. In Dubai, simply present a printed copy of your ticket or present on your smart phone for instant access. Viewing telescopes are available at the 124th floor but you will need to buy a card to use it. This is not included in the price. Ticket is not valid for the 148th Floor Sky Deck.